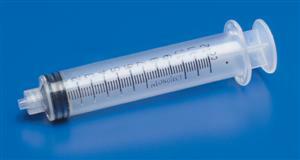 Monoject 12cc Syringe: Latex FreeBold graduations: 0.2ccUltra-sharp, tri-beveled, anti-coring needle. Luer Lock Syringe Tip on combination units. Color-coded translucent needle hub and rigid pack packing. Robust, compact package. Autoclavable in rigid pack for use in O.R./procedure packs. Sterile 12cc Syringe, Luer Lock Tip.